Baltimore, MD – U.S. gas prices dropped about five cents, on average, during the past week, as prices along the Gulf Coast dropped well below the $2.00 threshold. The U.S. average price came down to $2.23 per gallon this week, according to the weekly release from the U.S. Energy Information Administration. Many survey regions across the U.S. were below that average. The highest gas prices are found on the west coast, particularly in California. The average price of gas in the far west was $2.68 per gallon, the highest of all the survey regions. California, by itself, has an average gas price of $2.85 per gallon. 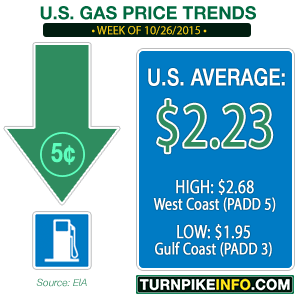 The lowest was the gulf coast, where the official average price fell to $1.95.